CHANDLER, Ariz. (February 9, 2019) – Scott Palmer has taken massive steps in his Top Fuel career each of the last two seasons, finishing in the top 10 for the first time in 2017 and advancing to his first career NHRA Mello Yello Drag Racing Series final a year ago in Phoenix. With that now under his belt, Palmer and his team have raised expectations considerably heading into the 2019 NHRA season. 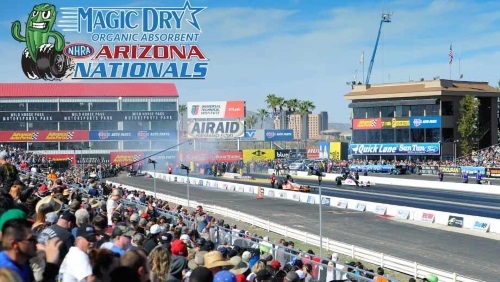 WHAT: 35th annual Magic Dry Organic Absorbent NHRA Nationals, the second of 24 events in the NHRA Mello Yello Drag Racing Series. 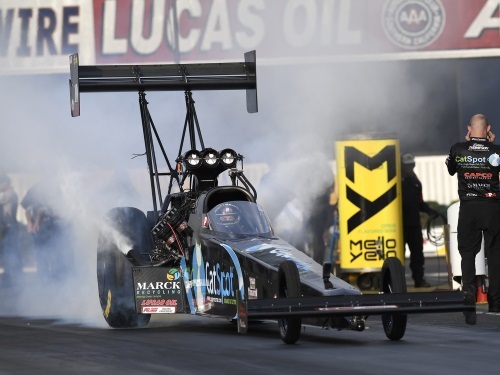 Drivers in three categories – Top Fuel, Funny Car and Pro Stock – earn points leading to 2019 NHRA Mello Yello Drag Racing Series world championships. FRIDAY, Feb. 22 – LUCAS OIL SERIES qualifying at 8 a.m.
MELLO YELLO SERIES qualifying at 1:30 and 4:30 p.m.
SATURDAY, Feb. 23- LUCAS OIL SERIES eliminations at 8 a.m.
SUNDAY, Feb. 24 – Pre-race ceremonies, 10 a.m.
Friday, Feb. 22, FOX Sports 1 (FS1), will televise one hour of qualifying at 11 p.m. (ET). 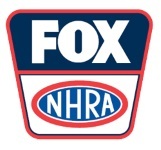 Saturday, Feb. 23, FOX Sports 1 (FS1), will televise one hour of qualifying live at 7 p.m. (ET). Sunday, Feb. 24, FOX Sports 1 (FS1) will televise three hours of finals coverage at 6 p.m. (ET). John Force, FC- 8; Bob Glidden, PS- 5; Tony Schumacher, TF- 5; Jack Beckman, FC- 3; Kenny Bernstein, TF-FC- 3; Antron Brown, TF-3; Ron Capps, FC-3; Larry Dixon, TF- 3; Cory McClenathan, TF- 3; Darrell Alderman, PS- 3; Kurt Johnson, PS- 3; Warren Johnson, PS- 3. Top Fuel – 3.649 seconds by Tony Schumacher Feb. ’18; 336.57 mph by Schumacher, Feb. ’18. Funny Car – 3.826 seconds by Courtney Force, Feb. ’18; 337.16 mph by C. Force, Feb. ’18. Pro Stock – 6.498 seconds by Mike Edwards, Feb. ’13; 213.77 mph by Mike Edwards, Feb. ’13. For tickets call (800) 884-NHRA (6472). Tickets also available online at www.NHRA.com/tickets.